In these cases the heart is just gradually giving out, be­ginning to dilate a little, becoming slightly irregular, while the patients are going down hill. If the condition is not so acute as to call for one of the four drugs we have been dis­cussing there are another three or four which you may find very helpful. That is quite apart from your ordinary pres­cribing. You find that in many of these cases in. which there is a tendency to cardiac failure, the heart picks up and the tendency to dilation disappears on your ordinary prescribing, and you do not need to prescribe on the cardiac symptoms particularly, that is to say, the patient responds to the drug for their general symptoms. 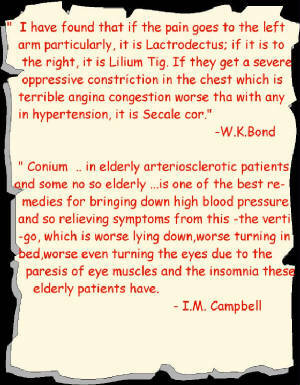 For instance, quite frequently in pneumonia, a bad case, with the patient pretty worn out with indications for Lycopodium there is a tendency to a failing heart, with dilatation, but after the administration of Lyco­podium the heart picks up, the pulse steadies, and the tendency to dilatation disappears. You find the same in all acute illnesses where the patient is responding to the particular drug indicated. But you also get cases in which the patient is doing quite well but there is a tendency to cardiac failure which is not responding to the apparently indicated remedy, then you have to consider the drugs for cardiac failure in addition.For these cases the most common drugs are the Snake Poisons, especially Lachesis and Naja. And less commonly Lycopus and Laurocerasus. It is very difficult to distinguish one Snake Poison from another in such conditions. In appearance they are all very similar, but much the most common remedies for these con­ditions are Lachesis and Naja. The Lachesis picture I think is pretty typical of all, and there are just a few indications which make one choose Naja in preference to Lachesis. In all these cases indicating the Snake Poison you get a rather purplish, bloated appearance. They suffer from a feeling of tightness or constriction in the chest, more commonly in the upper part of the chest, and they are intolerant of any weight or pressure of the bedclothes, or any tight clothing round the upper part of the chest, or neck. All are sensitive to heat; they feel hot and they dislike a hot stuffy room. They have a marked aggravation after sleep; they get acute suffo­cative attacks when they fall asleep and they wake up in increased distress. All these Snake Poison patients in their cardiac distresses have a marked aggravation from being turned over on to the left side. They have a very marked tremor, and their hands are shaky. And most of them as they tend to get worse be­come mentally fogged, confused, and very often become difficult and suspicious. If there were nothing more than that, one would give Lachesis. But in a certain number of these cases you get rather acute stitching pains which go right through the chest from the precordium to the region of the scapula, associated with very marked numbness, particularly in the left arm and hand. Where the numbness is pronounced one would give Naja in preference to Lachesis. If the pain — stitching in character — is more marked one tends to give Naja, but if the feeling of constriction is predominant tnen Lachesis is the remedy. But the general symptoms are identical. I think possibly Naja is a little less red, less bloated looking, a little paler than Lachesis, but that is not very striking. Apart from the Snake Poisons there are two other drugs which you will find very useful in these conditions. The first of these is Lycopus. You get indications for Lycopus in a case in which the heart is just starting to fail; it is beginning to dilate a little, and the pulse is tending to become a little irregular. The patients are pale rather than cyanotic, and are always restless. The outstanding symptom of the Lycopus case is that the patients complain of a horrible tumultuous sensation in the cardiac region. They very often tell you it feels as if their heart had suddenly run away and was just going mad. This is accompanied by a feeling of intense throbbing extending up into the neck and right into the head. The other Lycopus symptom which helps is that accom­panying this tumult in the chest there is a very marked ten­dency to cough. It feels as if the heart just runs away, it sets up an acute irritation, and they cough. Another Lycopus distinguishing symptom is that the dis­tress is vastly increased by turning over on the right side — a contrast with the Snake Poisons which are worse turning over on the left side. Lastly, these Lycopus patients have an intense dislike of any food, and particularly of the smell of food. The last of these drugs 1 want to touch on is Laurocerasus. The Laurocerasus picture is very definite, and I think the easiest way to remember it is to picture for yourself the appearance presented by a congenital heart in a patient 16 to 18 years of age. You know the peculiar bluish-red appear­ance of the congenital heart, somewhat clubbed ringers, which again are rather congested, and the bluish appearance.— almost like ripe grapes — of the lips. That is the under­lying colour you get in Laurocerasus. These patients always suffer from extreme dyspnoea, very nearly Cheyne-Stokes in character. They take a sudden gasp for breath, followed by two or three long breaths, then the breathing gets gradually shallower, next a pause, then two or three gasps, and so it goes on. Another feature is that the respiratory dyspnoea gets very much worse when the patient sits up; they are better in a semi-prone position. A point which is an apparent contradiction is that with this extreme cyanosis you get a very early tendency to the development of hypostatic pneumonia at the bases, and when it has developed the cough is very much more troublesome unless they are reasonably propped up. When lying down the cough is worse, yet if they sit up the feeling of constriction is increased, so they have to get a position midway between. These patients are always chilly. They want to be kept warm, and they feel cold to touch. And of course, as you would expect in a condition of that sort, any movement or exertion aggravates them acutely. Let us look now at the cases with definite anginous attacks. For these cases you must give the patient relief very speedily. It is a little difficult to pick out of the Materia Medica the most commonly indicated drug for it, but I think one can limit the choice to about one of half a dozen — Aconite. Cactus, Arsenic, Iodine, Spongia, Spigelia and Lilium tig.The outstanding characteristic of the majority of these cases in their first attack is an absolutely overwhelming fear. The patient is certain he is going to die, and that very speedily, and he is terrified. He is quite unable to keep still, and yet any movement seems to aggravate his distress. Here a dose of Aconite in high potency will give relief almost instantaneously. I have seen a case of that sort and put a dose of Aconite on the tongue and almost before the remedy could be swallowed that patient was feeling better. I usually carried 10m as my highest potency in general practice and I gave Aconite 10m. The man had a similar attack at a later date, and the anxiety, the distress, and the fear were nothing like so marked because he had come through one attack before, and Aconite had no effect at all. That has been my experience. Where you are dealing with the first attack and the patient is quite certain he is going to die, Aconite does relieve him right away, but does not act in a second or later attack. So if you get a man with his first attack, give a dose of Aconite and you will probably find in no time he is feeling more comfortable. But if he has had a previous attack Aconite will not be helpful. For the patient who is having a subsequent attack much the most likely drug to help is Cactus. Cactus has a good deal of anxiety and fear, but it is quite different from that of Aconite. It is not a fear that the immediate attack will be fatal, it is more a conviction that he has an absolutely incurable condition which will eventually kill him. That is one point about the Cactus indications. Another is the type of the actual distress of which the patient complains. He feels as if he had a tight band round the chest which was gradually becoming tighter and tighter and that if this con­striction did not let - up soon the heart would be unable to function. It is that feeling of increasing tension which gives you the Cactus indication. In addition you may get stabbing; radiating pains from the precordium, but they are not so characteristic of Cactus as the intense constricting feeling, which is, of course, just exactly how the majority of your anginous patients describe it. In these acute conditions I always give the drug in high potency because it acts much more quickly and one wants instant relief.Then you will get an occasional patient having an anginous attack with very similar constricting feelings, not quite so intense but a definite feeling of constriction. The patient has been ailing for some time, is rather anxious and worried, very chilly, and accompanying this feeling of con­striction there is an acute, distressing, burning sensation in the chest. These anginous patients respond very well to a dose of Arsenic. I have never seen Arsenic do anything in an anginous attack except in the rather broken down, ill-looking patient, who is a bit pale, rather withered looking, very definitely anxious, fearful, with that sense of constriction accompanied by the burning discomfort in the chest. And Arsenic does relieve these cases quickly. There is another type of case which is very similar to that; with very much the same sensation, but the feeling of constriction, the feeling of tension, is described as being actually in the heart itself rather than involving the whole of the side of the chest. The patients are just about as anxious as the Arsenicum patients — in fact all these anginous patients are anxious — but instead of the intense chilliness of the Arsenic they are uncomfortable in heat and in a stuffy atmosphere. They are just about as restless, but instead of the pale, drawn appear­ance which you get in Arsenic, they tend to be rather flushed, and as a rule they are dark-haired, dark-complexioned people. They are rather underweight, in spite of the fact that they have always been pretty good livers and very often have an appetite above the average although they have not been putting on weight. These cases respond exceedingly well to Iodine. Then there is yet another type of case in which instead of the complaint being of constriction it is of a progressive sensation of swelling in the heart region. It feels as if the heart gets bigger and bigger until it would finally burst, and this sensation of fullness spreads up into the neck. This sensation of fullness and swelling is very much aggravated by lying down, when the patient feels as if he would nearly choke and it is accompanied by very acute pain.The patients themselves are chilly and any draught of air increases their distress. In addition to the feeling of distension, they usually complain of more or less marked numbness, particularly of the left arm and hand, though very frequently there is numbness of the hand only without any involvement of the arm, and not infrequently they complain of numbness of the lower extremities too. As a rule the face and neck give you the impression of being some what congested; they do not have the pale, drawn, wrinkled Arsenicum appearance. And these cases respond well to Spongia. Another drug which you will find useful in a condition which is somewhat similar, though not an angina at all, but which you meet with in hysterical women. You will fail to find any cardiac lesion, but they will produce a symptom picture difficult to distinguish from a true anginous attack. They have the very marked stabbing, radiating pains, and often an intense hyperesthesia of the chest wall. They are very depressed, frightened, and intensely irritable. They are sensitive to heat, and their distress is aggravated by any move­ment. In addition to the stabbing pains they have the anginous sense of constriction, tightness, of the chest wall. These cases are usually associated with some kind of pelvic lesion, or a history of having had some gynaecological illness. 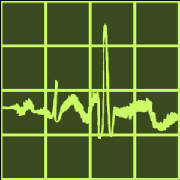 I have seen quite a number of these cases now in which an electro-cardiogram shows no lesion at all. And all the symptoms have cleared up entirely with Lilium tig. So you see when you are confronted with one of these very distressing conditions where you have to make a quick decision, it is fairly easy to individualize and get something which will give almost instantaneous relief. Dr. McCrae thought the paper was a masterpiece. There was nothing in it to criticize, there were details of valuable help to everybody which were like the artist sharpening his pencil to produce some line of particular splendour which would make the picture complete. Most had pencils but they were blunt, and the homeopath would always be grateful for these amazingly useful hints. Dr. John Paterson said that they had listened to a real clinical paper. There was not much which one could criticize, but one might add a little. With regard to the cardiac cases, Arsenic and Sulphur his experience was that Arsenic was often the acute of Sulphur and on the mental side they were the exact opposite. One found that a Sulphur patient swung in an acute condition to Arsenic and Dr. Boland had brought out that point. He was interested in the question of Aconite acting in the first attack but not in the second. There had been many discussions about covering the totality of the symptoms and here was evidence that the homeopathic remedy could be prescribed on the mental symptoms which worked in the first instance but it did not cover the whole of the case. 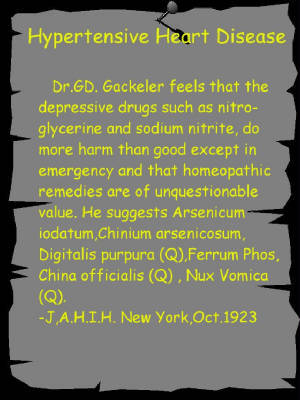 It was possible to prescribe homeopathically with­out covering the whole of the case, only covering a phase because obviously on the next occasion the pain was present but not the fear, the Aconite had removed one phase of the case — mental fear. Aconite came out very strongly in the air raids. Another remedy was Natrum Mur. He wondered if any orthodox practitioners were surprised that there was no mention of Digitalis but Digitalis was quite useful in these slightly relaxing hearts in homeopathic doses, not in the massive doses given in allopathic medicine. Dr. Stonham said that the paper was excellent and the sort of paper which would appeal to the general practitioner, who was always coming up against acute cases. To have such cases so plainly stated with the drug indications for them was valuable. There were one or two points he would like to mention with regard to Aconite which, as Dr. Borland had , was very useful in many cases. The case which he did not mention was the acute pulmonary oedema. He had given. Aconite 30 in such cases and it quickly calmed the patient in that distressing and somewhat dangerous condition and he had found it valuable not only in the first case but also in cases when the attack has been repeated. Dr. Borland said he gave Laurocerasus in acute heart complaints. He had had an acute case with Cheyne-Stokes respiration, it looked as if the patient would die, he gave Hydrocyanic Acid and he recovered very nicely. Many people would substantiate the value of Dr. Borland's paper. Dr. G. R. Mitchell said that a clinical paper was most useful. He wanted to criticize something Dr. Paterson said when he took the Aconite example as not prescribing on the totality. He would have thought it was an example of pres­cribing on that procedure because in the first case, on all the manifestations, Aconite was the drug, and it worked and on the second occasion there was a different totality, and the Aconite did not work. That was the way he would have re­garded the matter. Dr. Hardy added her grateful thanks to Dr. Borland for his paper. With regard to medicines for heart complaints she agreed with Dr. Paterson that Digitalis 200, one dose, was very effective in the semi-chronic or chronic case of the right sided congestion, blue face and blue nails, but not in the acute patient. She also used mother tincture Crataegus for heart patients because it was specific for the cardiac muscle. An­other drug which was used in Russia was Adonis mother tinc­ture, five drops to a dose. ..the wonderful collection of details on which indications had been given and which were of the greatest possible value. The paper would require a great deal of study, so that these indi­cations could be taken for future use. He was rather in favour of trying to keep the remedies which were very definitely specific for particular conditions because in cases where there was an emergency there was no time to seek for all the exact indications which might help, but he was rather surprised that Dr. Borland did not make more use of the Snake Poisons in heart cases because he must admit he would not be without Lachesis. If there was any suggestion of heart failure he would give Lachesis and would be surprised if it did not answer. There was one rather in­teresting point from the homeopathic point of view with regard to Snake Poisons and that was to think of the first thing which an individual felt when he was bitten by a snake, which was death, and when death threatened the patient ,the prescriber should think of the Snake Poisons. He mentioned this in a paper he read on Snake Poisons in Berlin just before the war and it attracted the attention of reporters who were pre­sent. In the Berliner Tageblatte there appeared in headlines, "When death threatens, think of the Snake Poisons.".. Dr. Alva Benjamin said that with regard to the collapse cases one would have thought that Dr. Borland would have mentioned Veratrum Album for cases of great coldness and excessive sweating. With regard to heart cases he had had a lot of help from Chamomilla, particularly when the pain was very severe. ..
Dr. W. Lees Templeton said that most of them felt that they had been back at school and he felt not only humbled but humiliated, for he must admit that he did not get such good results, possibly because one did not always get the symptoms. Most of the emergencies he saw were unable to give symptoms and one had to judge on appearances. He was glad, therefore, that Dr. Borland had elaborated on the ap­pearance of the patient, because that was important. With regard to drugs, he did not find Ant. Tart, useful in heart cases because he believed the pathology was different. He thought Ant. Tart, had a pulmonary pathology, not cardiac. Carbo Veg. had a great and justifiable reputation as the "corpse reviver" and it did work when the appropriate symp­toms were present. Cold sweat he looked upon as a guiding symptom for Verat. Alb. and he had verified its value in collapse. He was sorry that Dr. Borland was not more speci­fic in his diagnoses, e.g. if pain was due to coronary thrombosis he doubted if the high potency alone would ease this parti­cular pain in a matter of minutes. The wait with the patient for four or five hours for the second presentation was a serious matter when one was called out in the middle of the night, and like confinements many of these emergencies did occur at night. Why was this, he wondered? Please Click the picture for the article " Homocysteine : A 21st Century Model of Nutritional Medicine "